I loved A Wild Sheep Chase – I finished it a while back but finally got around to recording a couple of (brief) thoughts about it. For me, this is a great place to start if you’re new to Haruki Murakami. 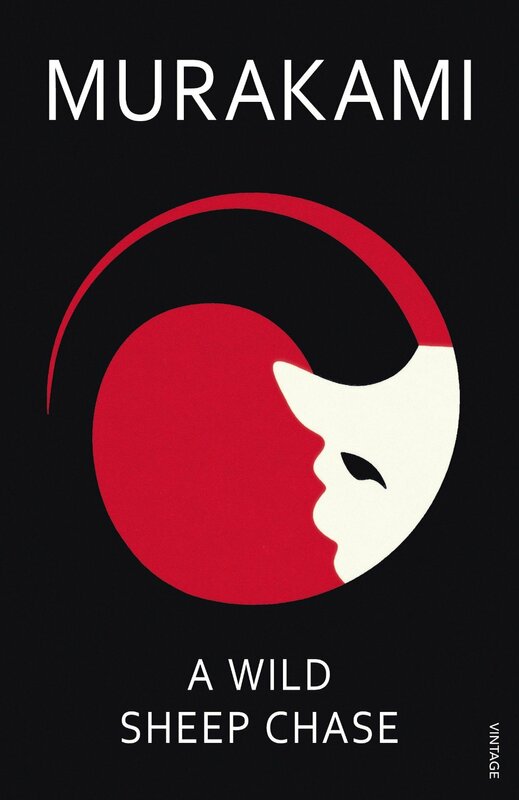 The story has all the classic Murakami elements; an almost detective-like search, a mysterious, bewitching girl and wonderful surrealist aspects – most strikingly perhaps, in one hell of a strange sheep that no-one can seem to find. Unlike say, The Wind-Up Bird Chronicle‘s wider scope, this shorter novel has a swifter storyline and also features more surrealism than another popular entry point to his work, Norwegian Wood. When I look back on it my strongest impression is actually (at first) thinking the ending wasn’t as strong as I was expecting, yet I found myself thinking about the end of the novel often in the days after. So, as it turns out, it was actually exactly what it needed to be. Definitely worth getting a copy. Another of my favourites – probably because it’s here that we first meet Haddock AND get treated to some of his fantastic strings of curses! There’s also a fantastic little sequence where Haddock is screaming for revenge and the snap-zooms and rage on his face is priceless. More fantastic full-page images here too – this issue feels jam-packed with them, though it’s the underside of the sea-plane one that I liked the best. Next up: The Shooting Star. I felt Ottokar’s Sceptre was ‘only’ good rather than great. It’s not that there are any clear faults – and we’re treated to another absent-minded professor, as Herge continued to warm up for Calculus’ eventual appearance – but the adventure was missing some tension for me. It might have been a case of expectations not quite being met, as I wanted a little more depth to the mystery of how the sceptre is stolen I think, more detail to that plot. 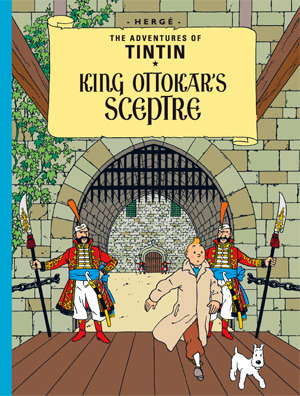 The premise I really enjoyed – the theft of a royal sceptre as a per-cursor to war between ‘Syldavia’ and ‘Borduria’ with Tintin having to thwart various war-mongers and duplicate professors, but I think the scale of the conflict implied didn’t really come off in the space of a single volume. There were some great mountain-based panels at the Syldavia border but again, for me, the range of colour and settings appeared a little repetitive this time around. Perhaps Herge put more effort into creating the warring countries in the story as stand-ins for Germany and Austria? Still, no Tintin adventure is terrible and this one is notable for the first appearance of Bianca Castafiore and her…powerful voice. Next up: The Crab with the Golden Claws. Fantastic! 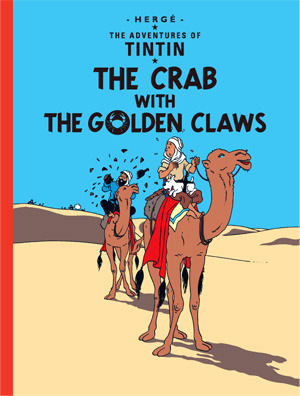 Not my all time fav but right up there among Tintin’s top 5 adventures I reckon. There’s so much to like here – it’s one one of the more deft, tightly controlled plots with Herge bringing together his usual twists, humor, intrigue and scene-setting in a brilliant work that never lets up but never feels rushed. I won’t rehash the plot but I was gripped instantly the first time I read this as a kid – and this time around – Tintin is shot on the opening page! His investigation sends him eventually to Scotland, sees him piloting a plane and taking on a gorilla, the poor, mistreated Ranko. In fact, I must say Tintin is VERY impatient with Snowy in this adventure too, thumping him a bit and generally being ungrateful. As ever, there are some wonderful panels and settings. I enjoyed seeing Snowy quite pleased with himself upon finding the bone and the detail inside Dr Muller’s home was lovely too. The great vertical panels where the fire inspector climbs to the nest also stood out – or the medium shot of the island and the ruined castle. In fact I wish there’d been more time spent on the island, it’s my only real issue with this volume – but as compensation, there were rakes – man’s oldest foe. Next up: King Ottokars Sceptre. 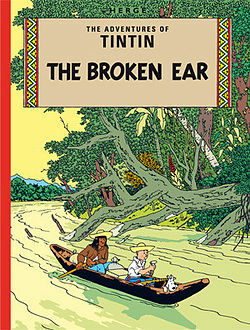 Finally posting the third entry in my 2015 Tintin reading challenge tonight with The Broken Ear! (So far I’ve also read Cigars & The Blue Lotus). This one’s a solid entry into the Tintin series for me– and a solid Tintin story is still pretty ace when you get down to it, but ultimately, it’s just not one of my favourites. During his search for the missing fetish with the broken ear, Tintin ends up in South America where he enlists in the army under the temperamental General Alcazar (who will go on to have other appearances in Tintin adventures) the high point of which being a pretty impressive car chase. As ever, there are some great phrases in Tintin comics – often insults or exclamations – and it was fun to see ‘great snakes’ in this one. I also really enjoyed the comedy around the ‘fake Tintins’ on the ocean liner scene. Especially noteworthy, I thought, were the devils who are seen taking two of the villains away right near the end of the story. Again, not the best Tintin adventure, but in no way disappointing. Next up: The Black Island. 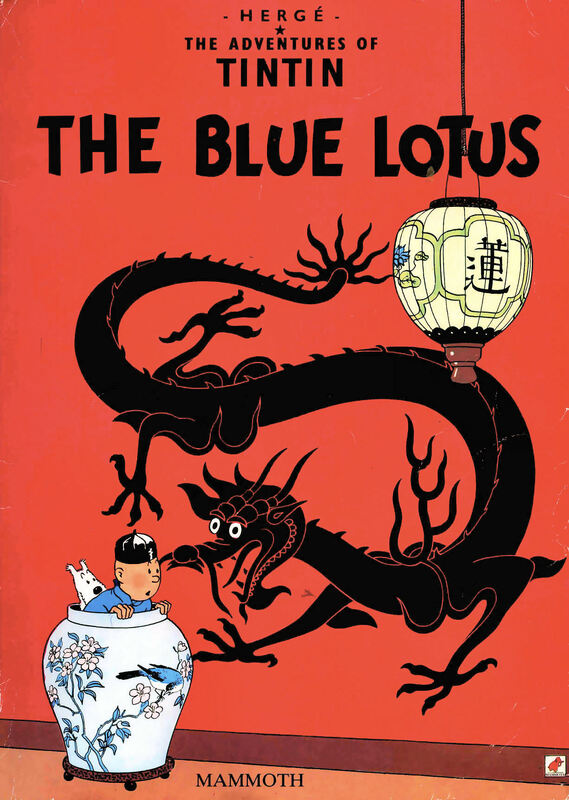 Continuing my 2015 Tintin reading challenge tonight with The Blue Lotus. Earlier in the month I read Cigars of the Pharaoh and the storyline from that volume actually wraps up here. The Blue Lotus is a special one for a few reasons, it’s got a pretty fantastic cover and some wonderful large panels, especially when entering towns, and perhaps most important to the history of Tintin, the introduction of Chang – who becomes vital to a future adventure. Another twisty tale with some great double-bluffs, perhaps the most impressive thing about this one is the changes Herge makes to his research. 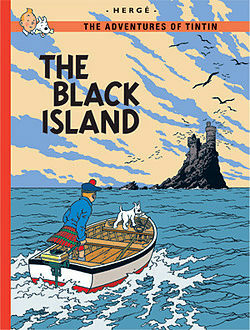 The setting is much more accurately rendered in terms of dress and backdrops, characters on banners etc and a more balance view on race – where Tintin even discusses cultural misconceptions with his new friend Chang. Thomson & Thompson return with one of their best single panels – where they attempt to blend into the streets of Shanghai with predictable results. I also loved hearing Thompson (or Thomson?) using the word ‘botheration.’ Fantastic. Next up: The Broken Ear.